Pallet trucks will not go up kerbs or stairs and can not operate on uneven or gravel driveways. The driver will not enter your home and will not carry goods. 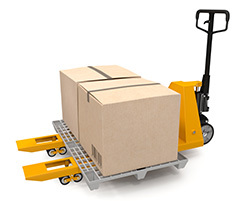 Drivers will only wheel pallets as far as a their pallet truck will allow them too. Marabese Ceramics use Aztek Logistics to deliver all pallets/large items. All pallet delivery companies offer 'kerbside only'. We don't have our own drivers and vehicles to deliver and bring goods into your home & can not offer any other kind of delivery service for palletised orders. If you have placed an order and are not happy with our delivery terms then please contact us on 01234 324598 to cancel your order before it is dispatched. Small items: are sent by Royal Mail Parcel Force. Upon dispatch fromourwarehouse you will receive an automated email and your order will arrive 2 working days later. Parcelforce will text you with delivery times and options. Small items: delivered by parcelforce - you will be left a card and your order will be taken back to the local depot, simply call to rearrange delivery, you can also collect from your local depot if you prefer. No, we only offer a kerb side delivery. The courier will wheel large items on pallets as close to the property as possible, or into a garage if there is access. Our couriers are not insured to enter your property. Small items will be delivered to your doorstep via Parcelforce.